Aluminum pergola is a very durable and maintenance free product designed to withstand North American weather. 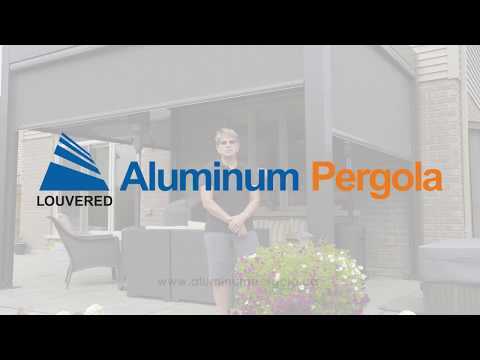 TORONTO, ON, February 09, 2018 /24-7PressRelease/ -- Aluminum Pergola is becoming more and more popular nowadays increasing its style and modernizing its look while adding a sense of sophistication to your outdoor area. It might be one of that missing things that will transfer your patio into a luxury propitiatory personal getaway. Pergola modern design create a comfortable seating area in your backyard. Flipping all of these marvellous pergola models through internet might inspire you in creating one in your living space as well. Many people dream about a big luxury patio for gathering with friends and family for barbecues, growing flowers and plants, making a safe place for children to play and having a spot where they can give their brain a rest and forget about all responsibilities and work for a while. It's a great dream to chase and a pergola can give an aesthetic modern touch and elegance sight to your backyard. So, what is a pergola and how it can provide an excellent complement to your patio? If you are looking for a quick answer "What is a pergola? ", in a nutshell, it is a projecting roof. But in the full meaning of a word, it is a construction of a row of columns with a roofing that are usually supported by cross-beams and solid bars, which together form a shaded alley. Example of Patio Pergola you can see on the website. Everything is evolving nowadays, becoming more and more accomplished. Pergola has not appeared from nothing. It is being popular for a long time already and is being known for a few centuries. Today it has the same structure, the same columns, the same purpose just with updated diversity and newstylish numerous designs. It doesn't matter whether it is built-in or free-standing pergola, in both ways this is lovely piece of your garden in whatever form it is constructed. Pergola modern design varies excessively and you can always give it a new look combining different elements and styles. All new and new designs are being created. As a fashion accessories for modern outdoor pergolas you can use curtains, which also will bring more shade and will protect pergola area from hot direct sun rays. Or you can install glass pergola to make the space of your house more spacious. Furniture is also the great idea to fill in the pergola so to transfer it into the dinning lounge space. Also it can be decorated with pillows, draperies and blankets to make it much cozier. The flooring will bring more home atmosphere as well as will provide more shipshape place for furniture. In very deed, there is a great amount of diverse options to be used to design a flamboyant modern pergola. All you need is your creativity in combining colors, accessories and ideas which will create an ideal home place of your dream. Aluminum Pergola is a relatively new product on the Canadian and U.S. market. Pergola made of aluminum with advanced opening and closing roof system built for any home or public space.